A drone, apparently carrying explosives, has been downed on approach to Russia’s Khmeimim air base in Syria from the militant-held de-escalation zone in Idlib, becoming the fourth such incident in three days, the military said. Russian air defense systems deployed at Khmeimim detected and neutralized the target early Saturday, the head of the Russian Center for Reconciliation of the opposing sides in Syria said, in a daily briefing. 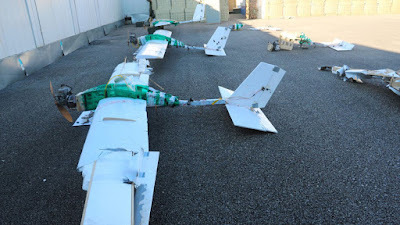 The hostile unmanned aerial vehicle (UAV) was, as usual, shot down at a safe distance from the base and the incident caused no injuries or damage, Maj. Gen. Alexei Tsygankov emphasized. On Friday, the Russian military also shot down two “small-size air targets” that came from the north, from a territory held by illegal armed groups. Earlier on Thursday, yet another aerial target was downed on approach. Shooting down militant drones has become somewhat routine for the Russian forces stationed in Syria’s Latakia province; over the past month at least 25 UAVs, reconnaissance devices or armed with various types of explosives, tried to penetrate the Khmeimim airspace. Moscow and Damascus have repeatedly pointed out that the remaining terrorist and illegal militant presence in Syria centers in the US-controlled areas, while those liberated by Syrian government forces areas are slowly recovering and joining the statewide reconciliation effort.